I'm watching the tribute to Bob Gainey. They're retiring his number in Montreal. He played his entire career for the Montreal Canadiens, captaining that team for nine seasons and never missing the playoffs. 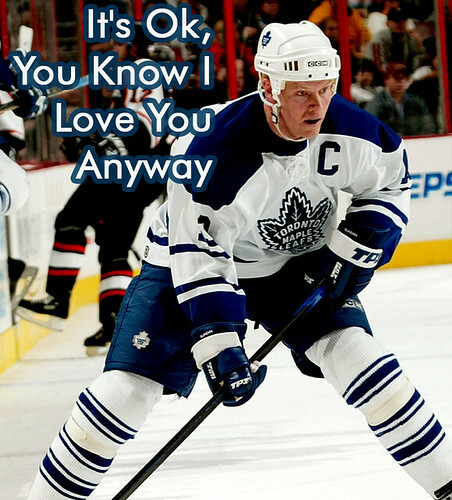 I'm not suggesting Mats Sundin is Bob Gainey, Mats certainly doesn't have the Stanley Cup rings, but Mats is the closest thing we have to a Bob Gainey. He's our Bob Gainey. I said this late last year in Mats, We Love You, Now Go!, but on this night it needs to be said again. Mats, it's ok. A loyal captain, I sense you're prepared to go down with the ship. This is a great quality, but this is one instance when we won't judge your loyalty should you agree to play elsewhere. In fact, as a life-long Leafs fan who has written 684 entries filed under Toronto Maple Leafs, I believe permitting Uncle Cliffy to move you to a contender will be viewed by Leafs Nation as a martyr-like sacrifice. It's ok, it's ok, you know I love you anyway. oh man, if Sundin is your Gainey then you guys are seriously hurtin. Mats Sundin and Glen Jacobs. Separated at birth.